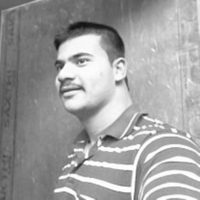 The traditional ice cream vendors have been encountering challenges in terms of commercialization potential, of late. However, organic ice cream industry, with its massive penetration across a multitude of geographies, is sending out waves of anticipation for a significant change in the way a typical ice cream has been conventionally viewed and consumed. The age-old reputation of ice cream being a nutrition-void, sugar-loaded calorie bomb has been going through a drastic makeover owing to the renewed vigour demonstrated by organic ice cream market giants. Rising health consciousness among the consumers has generated higher demand for natural fat-free or low-fat ice creams. As a consequence, this trend has indeed secured lucrative growth avenues for the global organic ice cream industry in the recent past. Moreover, numerous premium ice cream brands have been keen on maximizing the nutritional content in ice creams by adding an increased amount of organic ingredients - a factor that has contributed significantly toward upscaling the global ice cream consumption. Furthermore, a revamped cold chain infrastructure, refrigerated transport systems, and improved storage facilities have fostered the growth of organic ice cream industry. In fact, as per a research report compiled by Global Market Insights, Inc., the organic ice cream market surpassed an impressive valuation of USD 850 million in the year 2016, which goes on to explain the rising popularity of this business space. In this soon-to-be billion-dollar business space, vanilla, and chocolate have maintained to be the flavours of choice in both, artisanal and take-home ice cream product types. The rising demand for vanilla ice creams can be primarily attributed to the blending of all-natural and pure ingredients. Undeniably, this flavour has been regarded as the most versatile as it exhibits robust blending with drinks, bakery desserts, and toppings. If one glances through some statistics, it won't be surprising to take note of the astonishing popularity of vanilla ice creams. Apparently, vanilla organic ice cream industry accounted for more than 29% of the overall demand in 2016, as per reliable estimates. On the other hand, organic chocolate flavour has been gaining immense traction, of late, owing to the rising consumer awareness toward health benefits of natural cocoa. It would be prudent to mention that the proven benefits of dark chocolate in enhancing the skin texture and its ability to prevent cardiac diseases have profoundly attracted consumers to choose organic chocolate flavours in their ice cream products. Other key flavours to have contributed toward organic ice cream market share include strawberry, butter pecan, black raspberry, and mint chocolate. The major chunk of the demand for chocolate and vanilla flavour comes from families for multi-serving desserts on special occasions and gatherings - a major reason to have transformed the growth scenario of take-home ice cream products. As per authentic forecasts, take-home ice cream segment apportioned more than 50% of the global organic ice cream industry share in the year 2016, and in all plausibility, is likely to lead the overall product segment in the forthcoming years. Touted to be the leader in the organic ice cream industry, Nestle, in 2016, made a strategic announcement that it would intensify its efforts to upgrade its entire product portfolio. The initiative is aimed at transforming and simplifying six of its most popular brands including Skinny Cow, Outshine, Häagen-Dazs, Nestle Ice Cream, Nestle Drumstick, and Dreyer’s. Reportedly, the simplifying procedure would include the removal of harmful artificial colours and flavours, bio-engineered ingredients, synthetic fragrances, and high-fructose corn syrup from its manufacturing plants. The firm aims to switch to more real fruits, fresh milk from cows not treated with rBST, and is said to lower the sugar content by an average of at least 11% on its select brands. As per trusted reports, the launch of the new ice cream products had commenced in late 2016. Apparently, such transformative moves by premium ice cream brands are bound to leave an indelible influence on the organic ice cream industry. A renowned name in the American households, Alden's Ice Cream has recently launched its latest fully organic range of ice cream products. Apparently, the premium ice cream brand has released five new organic novelties which includes the new Orange Cream bars, Double Fudge Bars, Chocolate Chip Ice Cream Sandwich, Birthday Cake Ice Cream Sandwich, and Strawberry Ice Cream Sandwich. Reportedly, the firm has switched toward the classic orange cream blend with organic and clean ingredients such as milk from cows not treated with antibiotics or artificial growth hormones. Moreover, the new fully organic ice creams come with zero artificial sweeteners and no high fructose corn syrup. Needless to say, such swift acceptance of market demands by major organic ice cream industry players would mark the beginning of a new era of fully organic products. 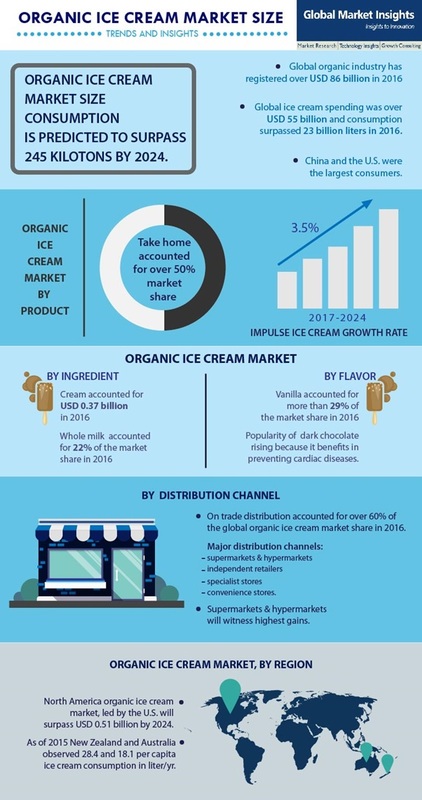 The technological advancements in organic ice cream market have largely been unnoticed or underappreciated, as the conventional methods hold a majority stake in the way this business sphere operates. However, some fascinating and 'accidental' discoveries have created a massive buzz in the organic ice cream industry, of late. Researchers at Japan's Biotherapy Development Research Center in Kanazawa City have reportedly found a new method to produce ice cream that does not melt. Apparently, the latest ice cream can retain its original taste and shape even at a temperature of 28°C. As has been reported, the research center was assisting strawberry farmers in the area who had been affected by the 2011 tsunami and earthquake. The Japanese researchers asked a pastry chef to make desserts of the damaged strawberries. However, the natural strawberry extract, known as polyphenol liquid, which was used in the dessert, kept solidifying the mixture. This is when the scientists realized that the addition of polyphenol stopped oil and water from splitting. Subsequently, the researchers used the extract to enable the ice-creams to remain frozen. The new ice cream has been reportedly launched in the Kanazawa city and has received a positive response from the citizens. This instance underlines the significance of innovation and that the firms partaking in organic ice cream industry would require such bold technological developments to stay relevant in this ever-evolving and competitive business vertical. Considering the aforementioned aspects, it is quite imperative that in order to keep up with the evolving needs, unique product launches and continued research to enhance the existing product portfolio seems to be the only way forward for the organic ice cream industry participants. To re-engage consumers and increase global ice cream consumption, focusing on business opportunities and flavour inspirations would prove to be of immense benefit to the prominent market leaders. Numerous organic ice cream market players including Weight Watchers International, Lotte Confectionary, and Humboldt Creamery and others are going global with their premium products. Utilizing organic ingredients such as 'organic cream', organic coconut oil', organic cocoa powder, and natural extracts would assist in rapid product penetration in the near future. Hence, it goes without saying that this tactic is certain to bring about a revolutionary change in the product sales, thereby impelling the organic ice cream market size, which is slated to surpass the consumption of 245 kilotons by 2024.